The Wii gaming system has become a popular choice among children and adults alike. The most fascinating and fun part of the Wii is it’s interactive game play, which allows you to simulate movements to play the game rather than only using a controller. 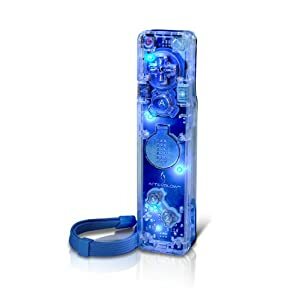 While the normal Wii remote works well, the new Wii Afterglow remotes are a flashy and fun addition for any Wii system. 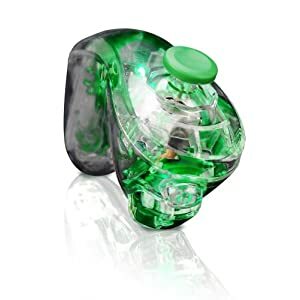 The Wii Afterglow remote controllers consist of a polycarbonate plastic body which house it’s components and green, red, or blue circuit board. LED’s inside the controller glow to match the circuit board color. 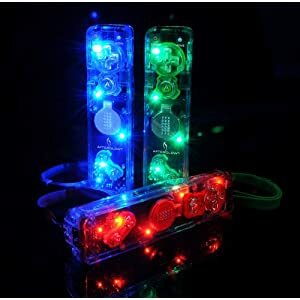 Whether playing in the dark or in light, you will be amazed at the vibrant glow that is given off by this new remote controller. The Wii Afterglow features greater precision for many action games, as the plus and minus buttons have been relocated above the A button. Horizontal remote gameplay is also improved by the tiered 1 and 2 buttons, which give a back-in-the-day feel to many classic virtual console games. The Wii Afterglow controller also features the ability to choose from three different modes of lighting which reflect different moods. The on, off, and acceleration modes give you an experience that you will not be able to attain with any other gaming system controller. The controller can also be secured by a matching game strap, ensuring that the controller will not fly out of the players hand. You will be amazed no matter what color Wii Afterglow you choose. The red, green, and blue are all striking in their own way, and exude a colorful display which only adds to the fun of the game play. The features, form, and luminous make-up of the controller is something that you will not get from any other gaming remote. You will also find that you can buy a USB charging cradle for this new Wii remote controller complete with ion batteries. The Wii Afterglow is available both online and offline through a variety of retailers. Anyone owning a Wii system already knows how much fun the game can be, and now the entertainment value of this system can become even greater with the addition of this innovative controller. Featuring a new outlay making games easier to play, a colorful experience, and a choice of how these colors are exhibited, the new Wii Afterglow is bound to become one of the most sought after gaming accessories of 2010.